Koalas ( Phascolarctos cinereus ). The adult moth has forewings each with a complex pattern of light and dark brown, crossed by an irregular white band. 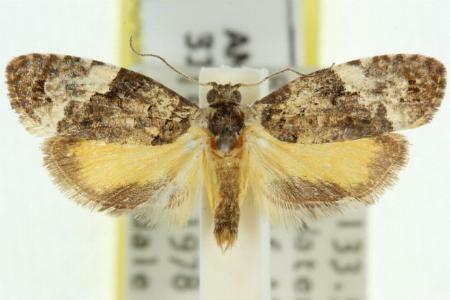 The hindwings are yellow, shading to brown at the margins. The wingspan is about 2 cms. Volume 21, Part 3 (September 1994), pp. 69-70. Volume 49 (1925), pp. 52-53.